My favorite memory is writing and reading the family christmas journal every year. We each write one page and then we read through it every year. I also love making cookies with the kids. Nestle wants to give one of my readers a holiday bundle featuring free coupons from Toll House (chocolate chips and cookie dough), Carnation Evaporated Milk and Breakfast Essentials, Stouffer’s, Juicy Juice and Boost Kid Essentials, as well as products from Wonka and Raisinets. The prize will also include a 4x6 silver photo frame and the Carnation holiday recipe guide. Scroll down to see how to enter to win at the end of this post. 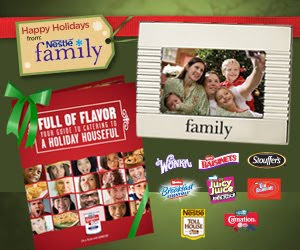 Be sure and enter the Holiday Memories Photo Contest at NestleFamily.com, too. Five grand prize winners will each receive a $500 gift card to make their holidays even more memorable, while 45 finalists will each win $50 gift cards. Make sure and enter your favorite holiday photos before January 4th! To enter and win a Nestle prize package similar to the one shown in the first photo above, please comment on this post with your favorite holiday memories. Entries will be accepted through January 13th and I'll pick the winner using Random.org. US readers are eligible. My favorite memories have to do with the night before christmas, waiting with the family to see what Santa would bring the next morning,. Favorite Holiday memory is getting a fire man hat for christmas. This was back when they had the Texaco gas station around. Being a girl, I figured Santa would bring me another doll, I asked for the fire truck and fire man hat for christmas that year, well I must have been good, that year I go a fire man hat with the Texaco logo and the fire truck for christmas. My favorite holiday memory was going to Rockefeller Center, ice skating, eating in the Promenade Cafe and attending mass. What fun! My favorite Christmas memory is leaving cookies for Santa :) *Thanks* for the giveaway! You are favored on my Technorati Page. Some years we cut down our own Christmas tree, which was always so fun - I want to do that again sometime. I was 5 and it was Christmas Eve,in our town Santa used to ride around on a sleigh the week before Christmas giving out candy to kids.This year the sleigh pulled up in front of our house and Santa started bringing in bags of presents.There were reindeer and elves and everything.To this day I do not know how my mom and dad pulled that off, but I will never forget it. My favorite memories are family time. All of the grandparents, aunts, uncles, cousins together having fun. There was the year my mom got me a set of the Chronicles of Narnia books to replace my set that was falling apart. My favorite holiday memories are when I watched my young children open their Christmas gifts. My favorite holiday memory is attending the candlelit church service christmas eve night with my family! I follow with google friend connect! My favorite holiday memory is going over the Grandma's house on Christmas Eve,drinking hot cocoa, eating fresh glazed donuts and Grandpa would read us the story Twas the Night Before Christmas. I am a subscriber in reader. My favorite memory was when I got 2 Barbie dolls and the entire trousseau (they had just come out). My favorite memories from Christmas have to be Christmas at my grandmas. She always had lots of goodies to eat - and I really miss her Fudge. My favorite memories are alwaysa watching the kids open presents! In good times and hard times,it is just simply''magical''! mine are of opening stockings then waking parents to show what we got! My favorite holiday memory is of driving to look at Christmas lights on Christmas night after dinner.